These are all the issues with the Codex that needs to be resolved. If you find issues with the site, please record them in the Unresolved section, also verify that things in the Resolved section are really working properly. After UI has been tested, set all codex user accounts to default to gallery skin. Need to determine how to do this since it appears that user preferences, including skins, are stored in a blob data type. 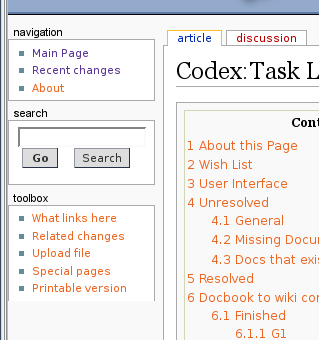 Customise MediaWiki:Sidebar (the left-hand navigation) See my sidebar for an example. Ask me if you need help. Add a link in the "Gallery 2 for Users" section to the Gallery2:Installation page. [Search] "Go" and "Search" buttons in the search box on left side of page seem to do the same thing. Remove one. Perhaps we need a customization section as well as a how to user guide section. *Rewrite as a How Do I article? [Search] Redundant to have search box at top of every page as well as on the left side of the page. This page was last modified on 1 July 2013, at 15:22. This page has been accessed 221,925 times.